First, you need to make some homemade Romesco sauce. You can do this a couple days in advance if you like (I do). Adjust the oven racks to the middle and upper positions, and preheat theoven to 350° F.
Drizzle the tomato halves with a teaspoon of the olive oil and a pinch of salt. Place the tomatoes. cut side down, on a baking sheet, and roast on the upperrack for 45 minutes to an hour, until they are soft and the skin has wrinkled and blackened slightly. Allow to cool, remove, and discard the skin. In a very small ovenproof skillet, saucepan, or dish, combine approximately 1/4 cup of the olive oil with the garlic cloves, to cover the cloves halfway. Roast in the oven on the middle rack about 20 minutes, until the garlic is soft and malleable. Allow to cool, and squeeze the pulp from the cloves. Reserve the oil and set aside. Spread the almonds and hazelnuts on a baking sheet (in separate piles). Toast on the middle rack in the oven for 12 – 15 minutes, until lightly browned. Place the hazelnuts in a kitchen towel, and rub them together to remove the skins. Meanwhile, on a hot grill or directly on the stovetop over high heat, char the pepper over an open flame, turning frequently until the skin is blackened on all sides and the flesh becomes tender. Place the pepper in a plastic bag or in abowl covered tightly with plastic wrap to steam until cool enough to handle.Using a towel, wipe off the charred skin. Remove and discard the seeds and ribs. Coarsely chop the pepper. In a small skillet, over medium heat, warm the reserved olive oil from the garlic. 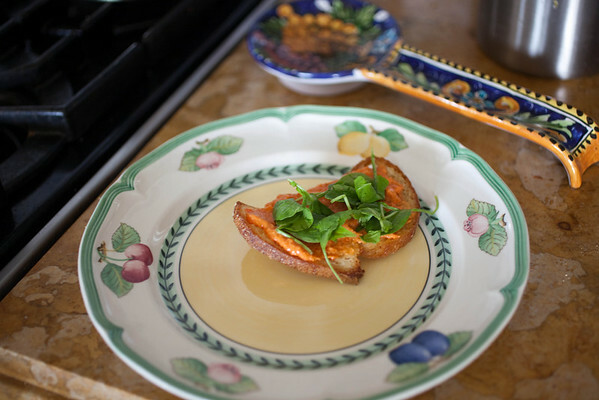 When the oil is hot, fry the bread on both sides until lightly browned. Remove the bread to a paper towel to drain. In a mortar and pestle, or in a food processor fitted with a metal blade, grind the nuts and bread until they form a coarse paste. Add the tomato, roasted pepper. vinegar, garlic pulp, cayenne pepper and salt and pulverize or process until smooth. Slowly pour in the remaining cup of olive oil and stir or process until combined. Season with salt to taste. lt will keep in the refrigerator for up to 5 days. A loaf or two of good rustic bread. I use La Brea Bakery rustic italian or similar. Cut into big slices. A tub of fresh Burrata, no more than two days out of the creamery. In LA you can buy it at Bay Cities Deli. If you live somewhere (most places) where you can’t get this tub of heaven, then you will have to use some good mozzarella. Next up is the bread. This can be prepared right before, or even a couple hours before eating. Get a real cast iron pan. No mamby pamby modern pans allowed. Fill it halfway up with olive oil and bring to a near boil. Be careful, if you get it too hot the oil will ignite and you will have to stick a lid on it (have one handy for snuffing fires) and wait for it to cool. Hot olive oil spontaneously combusts in the presence of oxygen. After the oil is hot, quickly fry the bread slices. This makes a mess, but they fry in 5-10 seconds per side. You end up with this, a plate of fried bread. This is yummy by itself or smeared with the Romesco. Wash your arugala and put it in a bowl, toss with black pepper and Meyer Lemon juice. Now that we’ve done the hard stuff. The following you do while your victims (guests) sit around the kitchen. This is sort of frenzied assembly because it needs to be eaten VERY soon after the egg gets poached (in the hot olive oil). So prep your bread. Take a piece, smear generously with Romesco and add some tossed arugala. Have the Burrata (or Mozzerella) handy nearby. Then add a nice blob in preparation for the egg. Burrata, when fresh it’s creaminess is visceral. 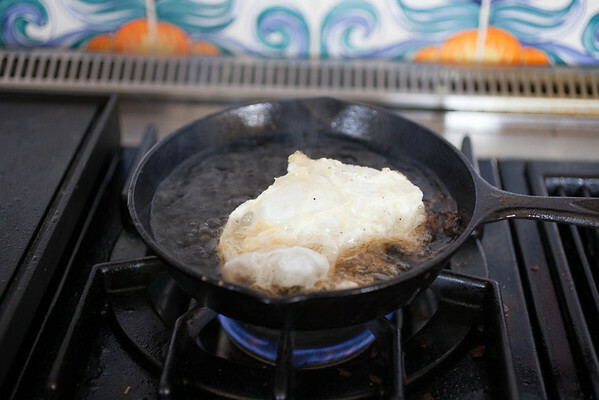 You can use your same hot olive oil (keep the bottle on hand to refill) to poach the egg. Have a slotted spoon and tongs ready. Crack an egg carefully into the oil. I use a small bowl, into which I crack the egg first, so that I can slip it quickly into the oil without splashing a lot of boiling oil onto my hands (a little is just a small price to pay for this dish). It poaches (I prefer not to think of it as fried) in about 10 seconds. Spoon some hot oil over the top. 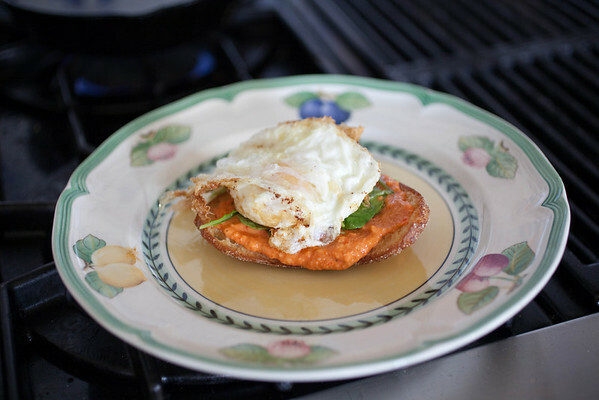 You want it crispy and fluffy, but the yolk totally runny. Then get it out of there fast with the slotted spoon, drain, and onto your prepped bread. Here it is again. Eat instantly. The yolk will run out and soak the crunchy bread. If you’re a more moderate person you could leave out the Burrata, or even not fry the bread, but the full monty is much better. 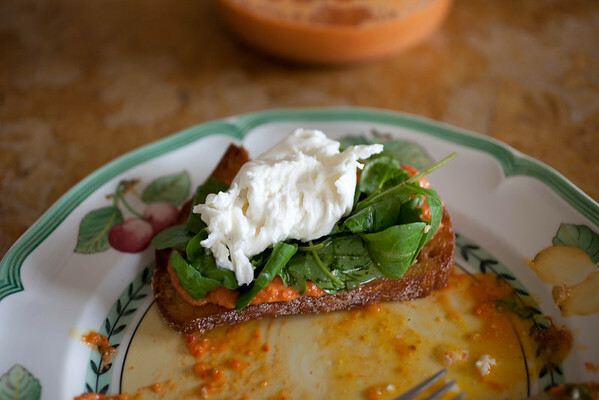 This entry was posted in Food and tagged Black pepper, Breakfast, Brunch, Burrata, Cayenne pepper, Eggs, Food, Garlic, Mark Peel, Meyer Lemon, Mortar and pestle, Olive oil, Poached Egg, Recipe, Romesco, Sourdough, Spain, vegetarian. This looks fantastic! 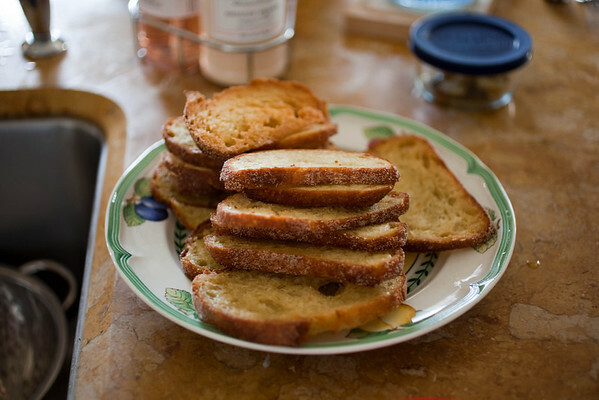 I can almost taste the crunchy, buttery olive oil fried bread…your photographs have me salivating and I look forward to reading and tasting your recipes AND I love your restaurant reviews! Great blog!